“It sounds like he’s doing well.” William leaned back in his chair, propping his feet on the matching ottoman. “So was Sonya,” William answered, grinning. Mr. Bingley, tired of “all the fussing going on,” had ejected his family from the hospital late in the afternoon. Charles had reached William, still in San Francisco, to advise him that they would be at home that evening. Sonya had made no secret of her annoyance, muttering, “I’m certainly glad Sunday is a day of rest,” as she rebooked William on an evening flight into John Wayne Airport in Orange County, near the Bingleys’ Newport Beach estate. After an hour of awkward conversation with Mrs. Bingley and Louisa—mercifully, Caroline was absent—he and Charles had settled into the walnut-paneled library. It was an unmistakably masculine retreat with its soft leather chairs, a well-stocked bar in the corner, and the acrid perfume of pipe tobacco hanging in the air. A fire popped and crackled in the fireplace, contributing ambience but little light or warmth. “It sounds like I got here too late to be of any help with the crisis,” William said. “Then let’s hear the rest.” William swirled the cognac in his glass, inhaling its aroma with appreciation. Whatever Mr. Bingley’s other failings might be, he knew good cognac. William decided it was pointless to protest that Elizabeth had cured him of disregarding his health. At the thought of her, a wave of pain threatened to engulf him, but he gripped his glass tightly and maintained a neutral expression while Charles continued his story. “He told me I’d had my ‘fun,’ as he called it, and it was time to move into the executive suite and start learning to run the company.” Charles paused to take another gulp from his beer bottle. “You’re his son, and clearly that means something to him.” William sighed, staring at the amber liquid in his glass. This wasn’t a good time to draw parallels to his own family history. “How old were you then?” Charles asked, folding his arms over his chest. “I’ve been telling myself that for years. But isn’t it maybe a crime to let yourself disappear in the process?” Charles’s voice, though quiet, held a note of desperation. William had no answer for that. He sipped his cognac and then stared into the glass in silence. William couldn’t think of anything helpful to say. “Protect her?” William sat forward. This sounded worse than he had thought. They fell silent. William settled back in his chair, his eyes drawn to the faint glow in the hearth. The accumulated effect of two sleepless nights was catching up with him, and he stifled a yawn behind his hand. William’s heart contracted, his only answer a weak smile. William hugged his arms around his knees and dug his toes deeper into the sand. The early-morning sun offered only anemic warmth, and a chilly breeze blew in from the ocean. He inhaled the damp salty air, tinged with the acrid odor of oil, though the offshore oil platforms, hulking gray ghosts floating behind the morning mist, might have suggested that detail. 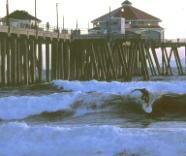 Huntington Beach, immortalized by Jan & Dean as “Surf City” in their 1960s song, was sparsely occupied on this November morning. A few runners and walkers moved along the water’s edge, and a group of surfers—Charles among them—bobbed about in the ocean like oversized seabirds, awaiting a wave worthy of their skill. William zipped up his jacket and shoved his hands in his pockets as the offshore breeze began to rise. Despite his current discomfort, the chill had its advantages. Combined with an energetic run along the beach, the bracing temperatures had cleared the worst of the fog from his brain, leaving behind only a few remnants of a third largely sleepless night. He had occasionally dozed, but his brief naps had been a mixed blessing, bringing with them two disturbing dreams. In the first, Elizabeth taunted him with his failings, her green eyes icy with contempt as she ordered him from her home … and her life. He awoke to find his mood dark, his eyes full of tears. His other dream was in its own way just as disturbing. Instead of rejecting him, this time she had played the consummate seductress, seeking out every sensitive spot on his body and besieging him with merciless pleasure. He awoke from this dream drenched in sweat, his heart pounding out a frantic rhythm. Sleep had eluded him after that. He had welcomed Charles’s quiet knock on his door not long after dawn, renewing the suggestion of an early-morning trip to the beach. William didn’t know how his life had become such a nightmare. Friday morning he had boarded a plane, anticipating the moment when he would slip the diamond ring in his pocket onto the finger of the most wonderful woman in the world. Only three days later he was alone and despondent, the ring stashed in the San Francisco penthouse, where it would remain until he could bear to dispose of it somehow. He tried to convince himself that he was being too pessimistic, that there was still a chance he could win her forgiveness. But he couldn’t believe it, despite Jane’s tentative encouragement the previous afternoon. Elizabeth, for all her virtues, was stubborn and quick to judge others. Without his persuasive influence, her opinions would calcify and their temporary estrangement would become permanent. Charles was up on his feet, balancing on a wave, but halfway to shore it tossed him aside. William didn’t realize he was holding his breath until he exhaled in a loud rush when Charles’s head emerged from the foaming water and he reached for his surfboard. Then, as though he had hit “play” on a paused video, William resumed contemplating his troubles. Last night, Charles said I was a person who makes things happen. But how do I do that with Lizzy? She would judge him harshly if he failed to keep his promise to stay away. Gifts wouldn’t work either; she would scoff at them as examples of his tendency to throw money at problems. Though what’s the point in having money if you can’t use it to make the lives of the people you love better? Three small shorebirds toddled past in search of breakfast. William’s melancholy expression softened as they skittered away from the rising water, and then abruptly veered toward it, and away from him, when he startled them by stretching his legs. The roar of the ocean seemed to grow louder, punctuated by distant shouts. William glanced up to see that Charles and two of his comrades had caught by far the largest wave of the morning. 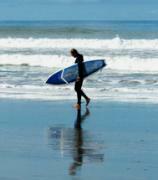 Looking every inch the quintessential California surfer, he skimmed across the curling wall of water, moving in tandem with the wave in a powerful yet graceful pas de deux. When the wave disintegrated into chaos near the shore, he dropped off his board and trotted out of the surf, his eyes flashing in triumph. “Well done,” William said. He admired his friend’s ability to compartmentalize his life, finding enjoyment even in the midst of a crisis. A few minutes later they stepped through the doors of Ruby’s, a red-roofed structure at the end of Huntington Beach Pier decorated in the style of an old-style diner. William couldn’t help smiling at the sound of the cheerful 1950’s tune—the one about the purple people eater—playing in the background. Finding himself unusually famished, he added scrambled eggs to his usual Spartan breakfast, and when the food arrived he ate with gusto. Charles ate heartily as well, sharing stories of his teenaged hijinks at the beach between bites of his huevos rancheros. “It sounds like you practically lived at the beach while you were in high school,” William said. “I assume there’s a commemorative plaque on the spot.” William’s sarcasm masked envy. His teen years had been spent chiefly in practice rooms and concert halls, while Charles had drifted through a golden stream of carefree days. “How old were you, your first time?” Charles asked, spearing a mouthful of eggs. Charles’s whoop of laughter turned into a cough when he nearly inhaled his coffee. “Sorry,” he sputtered, gasping for air. “I don’t mean to make fun of—” His words dissolved into a coughing fit. The long drive to the hospital was a quiet one, the light-hearted mood of their morning left behind at the beach. Charles seemed fully focused on the road in front of him, his fingers tapping incessantly against the steering wheel, his conversation limited to occasional remarks about area restaurants and jazz clubs they might visit that evening. William used the time to wrestle with a perplexing dilemma. He intended to find out the truth about Jane and the pre-nup and, if necessary, confess his error. But he was determined to conceal the sorry state of his relationship with Elizabeth. His impromptu trip to Los Angeles was proving a blessed distraction, but should he open the emotional floodgates he doubted his ability to shut them again. Yet the two matters were tightly interwoven, as Charles’s inevitable questions would demonstrate. Running offered William similar benefits. He grunted softly, nodding, as they passed through the oversized revolving doors and into the massive lobby. “I’d rather walk on the beach than on water.” Pemberley was located just a short drive from Bathsheba Beach, a well-known surfing spot on the east shore of Barbados. They rounded a corner and saw Caroline, hands on her hips, tossing her mane of copper-colored hair. She towered over the petite blonde nurse, her height advantage magnifying the impact of her imperious glare. Relief flooded the nurse’s face when she saw Charles approaching. “Hey, there, Caro, what’s up?” Charles asked, kissing his sister’s cheek and offering the nurse a reassuring smile. Caroline’s eyes darted to the side and then back. “It’s … a business matter. I have to leave at once, and I have to speak to him before I go.” Her gaze landed on William, and her harsh expression softened. “William, you’re such a dear to come down and keep us company.” She stepped forward to kiss him but he drew back, eyeing her with glacial disdain. Her scowl returned as she stepped away from him. “Where’s Mom?” Charles asked. “Down in the lounge?” Louisa, satisfied with her father’s progress, had left for home that morning, but they had expected to find Mrs. Bingley already at the hospital. “I haven’t seen her.” Caroline rummaged through her purse and extracted her cell phone. After a quick glance at the display she jammed it back into her purse, her vermillion lips pressed together in an angry line. “Why doesn’t that idiot call me?” she hissed under her breath. “I’m not leaving this spot,” Caroline insisted, hands on her hips again. William was surprised not to hear the rapid-fire click of Caroline’s heels in hot pursuit as he and Charles headed down the hall, but when he glanced over his shoulder she was still standing guard outside Mr. Bingley’s door, staring at it as though willing it to open. “I will, Daddy, but—” Caroline’s head swiveled toward the door and she fell silent. “Hello, Father.” Charles stepped toward the bed, wearing a smile that looked a few shades too cheerful to be genuine. His greeting withered in the face of his father’s angry stare. Charles seemed to shrink two or three sizes. William pressed his lips together, shaking his head. If he were ever lucky enough to have a son, he vowed to remember the chilling power of a father’s disapproval. “And you’ll take care of what we discussed.” It was a statement, not a question. “Of course, Daddy,” she said in a soothing voice, leaning over to give him a kiss on the cheek that he seemed to tolerate but not welcome. “You can count on me.” On her way out of the room she brushed against William, her quick but sultry glance making it clear that it was no accident. Once she was out of sight, William stepped toward the door. “If you’ll excuse me, I’m going to wait in the lounge.” he said. “I’ll be right down the hall,” William said firmly, despite the imploring look in Charles’s eyes. His presence would not soften Mr. Bingley’s verbal blows; it would merely add the humiliation of a witness. And if Charles chose to stand up to his father, any hint that his defiance required the moral support of a friend would damage his cause. William sat in the lounge for several minutes, doing his best to concentrate on his book while a bored-looking teenager flipped channels on the television and slurped noisily from a soda cup. Finally Charles appeared, looking pale and agitated. “I need to go downtown, to the office,” he said, his voice trembling as he rubbed a hand against his cheek. “I know what you’re going to say, Will. I’m fine, really … or at least I will be.” Charles’s grim expression suggested otherwise. “Let’s get going.” He led the way down the hall. They arrived at the elevators just as Mrs. Bingley emerged from one. She greeted them in her whispery voice, inclining her head toward the pile of clothing clutched in her hands. “I’m glad you’re here. I need your advice. Your father sent me back to the house for some things.” She led the way back to the lounge and, once there, deposited her bundle on a table, displaying a collection of bathrobes and slippers. “I’m glad to be here,” he replied. She might have been an attractive woman once, with her delicate features, blonde hair, and cornflower blue eyes—Charles’s eyes. But her face bore the ravages of a lifetime of worry, habitual sadness dimming her glow to a mere flicker. She turned away from them, drifting down the hall without a sound, her body curling in on itself as though she strove to take up as little space as possible. Charles tapped out a constant rhythm against his thigh while they awaited an elevator. At last the doors opened and they stepped aboard. Charles thrust out his arm to stop the doors from closing. “I’m sorry,” he muttered. “I have to—” He nearly leapt off the elevator, followed by a perplexed William, who had to move briskly to keep up. Mrs. Bingley’s trembling voice responded, the words too soft to be intelligible. Charles stared at her, tension building in his jaw, and then pushed past her into his father’s room. William and Mrs. Bingley followed behind, pausing just inside the door. “What gives you the right to speak to Mom that way?” Charles glared down at his father, practically breathing fire. William had never seen Charles this way before. “I don’t see how it’s any business of yours how I speak to my wife,” Mr. Bingley answered, his voice icy calm. “Charles, it’s all right,” Mrs. Bingley said, stepping forward. Charles opened his mouth as if to speak, but he closed it again, frowning. He shot a bewildered glance at William. “No.” he said softly. “What?” Mr. Bingley struggled to sit up straight, grunting in pain as he moved. “No,” Charles repeated, with more conviction this time. The surprise on his face might have been comical under other circumstances. “What did you say?” Mr. Bingley eyed Charles warily. “Enough of what?” Mr. Bingley’s growl might have yanked Charles back into line under normal circumstances, but this situation was anything but normal. “Stop wasting my time and explain what you’re talking about.” Mr. Bingley yanked the covers up higher across his chest. William coughed to conceal a snicker. Mr. Bingley apparently didn’t know his daughter very well. William considered protesting, but he didn’t want to end up in the middle of this confrontation. He retreated to a corner near the door and leaned against the wall, hands in his pockets. Mrs. Bingley stepped to his side, touching his arm in a superfluous gesture of comfort. The nurse poked her head into the room. “Is there a problem?” William caught her eye and shook his head, and she vanished. He pulled the door shut to stave off further interruptions. He extended his hand. Father and son stared at each other, silent and immobile. Mrs. Bingley stood frozen in place as well, her hand pressed to her mouth. Mr. Bingley was the first to look away, staring fixedly at the ceiling, and Charles’s outstretched hand dropped to his side. “And now I need to rest. I’d like you all to leave.” He reached for the control hanging over the bed rail and lowered himself into a reclining position. “You don’t work for me anymore.” Mr. Bingley’s voice sounded like the flat computer-generated voices William hated to hear on the telephone. William opened the door and stepped out into the hall with Charles close behind him. Mrs. Bingley remained behind, fussing with her husband’s blankets and speaking to him in a soft voice, though he seemed to be ignoring her. Charles and William remained silent until they reached the visitors’ lounge, which was empty. “What just happened?” Charles asked, shoving his hands into his hair. “I’m not entirely sure,” William said. Charles embraced her, and William heard her little choked sob. He rose to his feet and crossed the room, his book tucked under his arm. “I’ll be in the main lobby,” he said softly, slipping into the hall.